What makes for "good use" of a computer lab, laptop, or tablet cart? The prevailing pedagogy for "21st century" or "rigorous and relevant" learning would say the ideal involves students engaged in some relevant, collaborative inquiry-based project, or simulating/investigating a model not otherwise possible or enriched by software/the web. Is standardized testing good use? Is practice-testing for computer based standardized testing good use? Is content-related gaming good use? Is word processing good use? Is watching tutorial/flipped classroom videos good use? Are drill and kill practice websites good use? The answers to all of these questions depends on the current situation in your building and the current needs of your students. 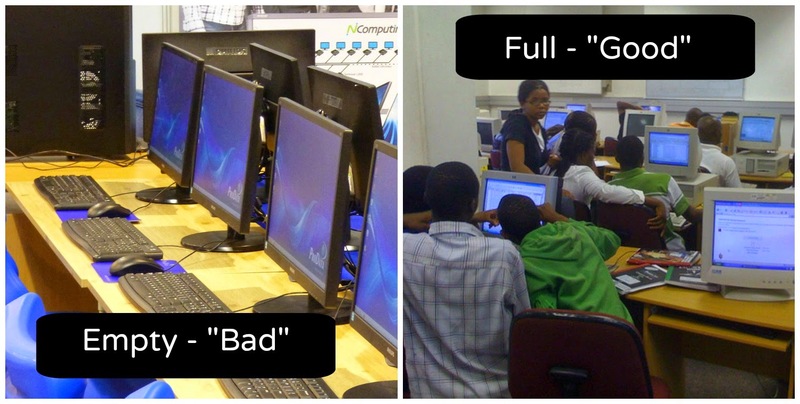 Clearly, if all of your students have access to computers and a lot of bandwidth at home, using the lab for students to finish projects or watch videos may not be a good use. However, if you're choosing between students turning in 1970s-era projects or giving kids access to create polished, media-rich projects at school, the best use of resources is to have kids create in the lab. Bottom line, the best use of school technology resources is to USE THEM. Once we're fighting everyday for access to the lab or carts then we'll be more selective and demanding of the way they are used.